Saudi Arabia is not being threatened by Iran or anyone else. But the kingdom is a threat to others, specifically to Yemen, where Saudi bombs have killed numerous civilians and laid the poorest Arab country to waste. Saudi Arabia in fact is committing war crimes in Yemen—which, to be fair, also happened during Obama’s tenure, when the Saudis received logistical and intelligence support. Meantime, Saudi Arabia contributes nothing to resolve the most difficult Middle East issues, such as the Israel-Palestine conflict and Syria’s civil war. Nor will they get rid of madrasas (religious schools) that preach wahhabism at home, nurturing future terrorists. Expect the Trump administration to proclaim that it has effectively overridden Saudi Arabia’s estrangement from the US during the Obama years. “Partnership” is the word of the day, but that is as tentative now as it was before—a cover for mutual suspicion, limited common interests (which include disregard for human rights), and love of oil. 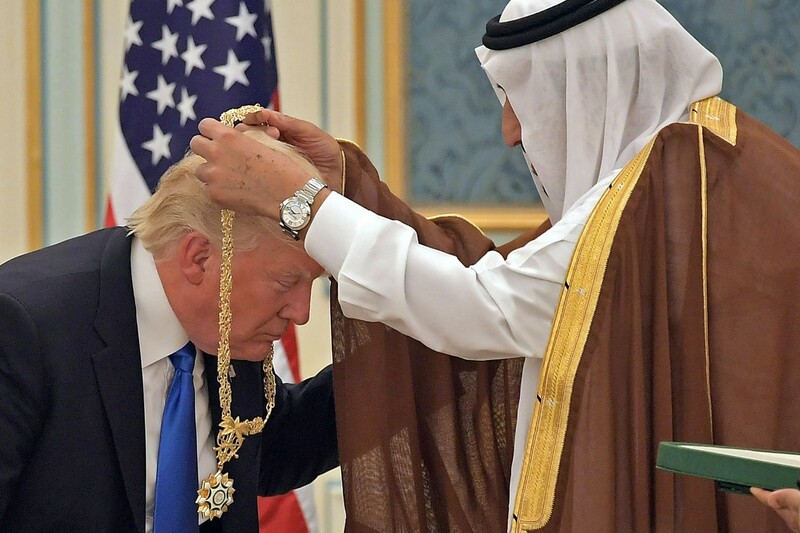 Trump has a long history of criticism of Saudi Arabia (see www.washingtonpost.com/news/the-fix/wp/2017/05/20/trump-received-an-elaborate-welcome-in-saudi-arabia-a-country-he-bashed-for-years/), has demeaned Muslims since Day One of his campaign, and seeks to keep as many Muslims as possible out of the US. His preaching of respect for all religions rings hollow; no rightminded person would take his speech seriously—all the more so as it was written by Stephen Miller, the pride of Breitbart and a well-known demonizer of Muslims. Through 2016 the Saudi Arabia-led coalition continued an aerial campaign against Houthi forces in Yemen that included numerous unlawful airstrikes that killed and injured thousands of civilians. Saudi authorities also continued their arbitrary arrests, trials, and convictions of peaceful dissidents. Dozens of human rights defenders and activists continued to serve long prison sentences for criticizing authorities or advocating political and rights reforms. Authorities continued to discriminate against women and religious minorities (https://www.hrw.org/world-report/2017/country-chapters/saudi-arabia). Michael Dolan of the Hudson Institute, a conservative think tank, argues that Trump’s trip provides an opportunity to create a “Trump Doctrine” that will remedy the weaknesses of prior US policy, particularly toward Iran (www.nytimes.com/2017/05/19/opinion/trump-doctrine-middle-east.html). Dolan says that Trump’s “hard-nosed ethos and willingness to question foreign policy dogmas” can be the basis for this shift. Saudi Arabia, along with Israel and Turkey, should be the key allies in a coalition to deter Iran—a gift to two authoritarian regimes and one, Israel, that under Benjamin Netanyahu rejects an equitable peace with the Palestinian. Dolan’s “steely-eyed realism” is actually crackpot realism. It ensures continued repression and warfare by the Saudi government using US weapons—“continued,” because the deal actually builds on a $115-billion weapons sale concluded during the Obama administration. Such realism is also likely to ensure ongoing conflict between Israelis and Palestinians, and quite possibly the undoing of a nuclear agreement with Iran, giving Iran’s hawks reason to revive its nuclear-weapons program and support anti-US groups throughout the Middle East. In short, if Trump buys into Dolan’s “steely-eyed realism,” it will mean adopting an old doctrine, not a new one—namely, winning the favor of repressive regimes with more money and weapons, and in return getting blowback in the form of terrorism, weakening of civil society, abuses of human rights, and strengthening of autocratic rule. If the human interest guided US relations with Saudi Arabia, military aid would be drastically reduced, particularly weapons and other help for the Saudis to continue their air war in Yemen. To be brutally honest, the US does not need Saudi Arabia—certainly not for its oil, which a long-term US energy policy focused on renewable energy sources and conservation would ensure. As I have argued previously (see Post #105), relations with the Saudis should be thoroughly reevaluated in the context of major changes in US policy toward the Middle East as a whole—including elimination of the tilt to Israel, development assistance to the Palestinians, deepening of engagement with Iran (especially now that Hassan Rouhani has won reelection), a refocusing on helping build civil societies, and an end to interventions in Syria, Libya, and Afghanistan. Foreign policy begins at home, however. The best thing the Trump administration, or any administration, can do to promote meaningful national security is to seriously confront climate change, move away from reliance on fossil fuels, promote universal health care, and run a transparent, trustworthy government.